Hodge's is still knocking it out of the park after the fantastic media-preview dinner that I attended before they opened (although I was sad to see Chef Adam Bostwick leave the kitchen). I'm looking forward to my third visit there this Saturday. I leave you with this, their bright and delicious Asparagus Soup with crispy pork crackling and creme fraiche ($6). Last night was one of my favorite things to attend- a L'Albatros wine and cheese dinner hosted by General Manager and Sommelier Brandon Chrostowski. They host these events a couple of times a year, and we now never miss them after experiencing our first one last year. Actually, "R" no longer allows Girls' Night for the cheese dinners after attending his first this past January. It is a night filled with delicious cheeses and bold wines, as Brandon takes you on a journey. Our journey was through Ohio last night. The event featured eight cheeses and eight wines that Brandon found not too far from our fine city. Many people were familiar with the wineries featured, including Firelands Winery, Grand River Cellars, Markko Vineyard, Chalet Debonne Vineyards, Harpers Field Vineyard, Saint Joseph Vineyard, and Laurello Vineyard. Our favorite white wine was the Chardonnay from Markko, and I enjoyed a couple of the reds. Starting the night off with some bubbly from Firelands wasn't a bad way to begin the meal either! But, of course, the real star of the event was the cheese. Ah, the glorious cheese. Eight different cheeses, both hard and soft, mild and bold. Our favorite was the hard Ludlow cheese (pictured at 6:00 on the plate), but we did purchase three at the end of the night. That's the best part! You can purchase any of the cheeses beginning at a 1/4 pound, and all of the wines are available as well. You get to continue the fun at home. While this wasn't my favorite cheese event that I've attended, it was fun to explore our own state. Most of the cheeses were just a tad mild for my personal taste. Tonight was Market at the Foodbank to benefit the Cleveland Foodbank's Harvest for Hunger Campaign. I'm back home already in my sweats with a full belly (still recovering from the fun of Alana's #BVBonfire party last night). The Foodbank moved the event (formally Market Under Glass) to their warehouse facility this year. Guests were able to wander through the volunteer repack area and warehouse, and see exactly where their donation will go. For every one dollar donated to Harvest for Hunger, the Foodbank can provide four meals in a local hunger center. With just over 1,100 tickets sold to tonight's event- that's a lot of meals! Highlights included soup from Spice Kitchen & Bar (co-chair of the event), lobster mac and cheese from Pickwick & Frolic, and crab salad from Pearl of the Orient. But the real surprise tonight...our favorite dish was from Giant Eagle. Yup, the grocery store chain. Seared ahi tuna with a risotto cake. It was so good that we had two. Talking with the staff at the table, they told us that a lot of Giant Eagle stores have a trained chef on staff, and that they are really trying to change people's perception of their catering and on-site offerings. They certainly made a believer out of me. If you missed Market at the Foodbank tonight, it's not too late to support the food and funds drive. Harvest for Hunger is still accepting donations. Visit www.harvestforhunger.org for more information or to donate online. Spring and Summer are always packed with fun events in Cleveland. The warm weather and sunshine brings us out and about, and it's truly my favorite time of year in our city. There are a few upcoming events that I wanted to share with you. Monday, May 14th- Dinner in the Dark takes over Washington Place Bistro in Little Italy. 6:30PM. This monthly series brings together diners and chefs for a night of fun and creativity in the kitchen. Diners are "in the dark" about what will be served that night, and who is in the kitchen. Six different chefs expertly create a multi-course meal, with wine/cocktail pairings. $65 plus tax and gratuity. All proceeds benefit a charity of the month. May's event will benefit The Dancing Wheels Company and School. These events tend to sell out quickly, so don't wait! Wednesday, May 23rd- Cleveland Magazine's Silver Spoon Awards to benefit the Arthritis Foundation. 6:00PM. Cleveland Marriott Downtown at Key Center. Sample food and drink from restaurants that have won a 2012 Silver Spoon Award. $85 for General Admission, or $135 for a VIP ticket. 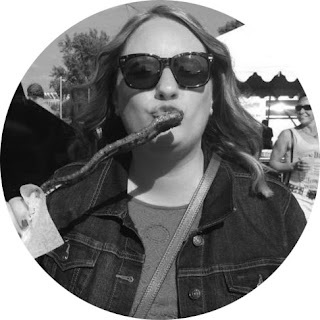 Thursday, May 24th- Emerging Chefs present "Snout to Tail- an Urban Pig Roast" with Melissa Khoury from Washington Place Bistro (formally of AMP 150). $65, or $75 for the Chef's Table. Event will be held at Dunham Tavern & Museum. 6:00PM. Sunday, June 10th- Chef Jam at the Rock Hall, featuring over 20 of our area's chefs as they create a dish inspired by their favorite rock star or band. Wind your way through the exhibits as you enjoy food and cocktails, and then listen to live music from great local bands. $65. I am sharing this event now, because tickets go on sale this Monday, April 23rd and they have sold out quickly the past two years. This is my favorite summer food event! These are just a couple of my favorites, and I have attended all of them in the past. Emerging Chefs host rotating events that are different every time, but they always do a nice job and feature some really talented chefs. I will be attending Dinner in the Dark and Chef Jam on my own dime. Any other upcoming events worth sharing? What event do you look forward to most in the spring or summer here in Cleveland? Last night, a random bandit of four social media friends met at Cafe Tandoor in Cleveland Heights to sip on some wine and share a meal of delicious Indian cuisine. It was my first time at Cafe Tandoor. Parking was a breeze, with metered street parking available and a large lot in back of the restaurant that was available for customers after 4:30PM. Unfortunately, the restaurant was pretty empty- but that did mean that we were seated right away, and had attentive service all evening. We were in luck- Tuesday is 50% off wine night. So that $24 bottle of Chardonnay quickly became a steal at $12. Three of us share a love for Indian food, and two from the group had been to Cafe Tandoor before- so we easily decided on three dishes to share: Butter Chicken with marinated chicken in a fresh, creamy tomato and butter sauce ($13.50); Sagg Gosht with lamb and spinach cooked with onions and garlic ($13.50); and Matar Paneer with paneer (cheese cubes) and peas with tomatoes in a light sauce ($10.50). The Butter Chicken ended up being the table-favorite, but we had a nice variety of dishes and overall I enjoyed all three. We also shared an order of Plain Basmati Rice ($2.50) and two orders of Garlic Naan ($3.50). Naan just pairs so perfectly with everything. I love dipping it in the flavorful sauces. We ordered each of the dishes at medium-hot heat, with the Butter Chicken having the most noticeable kick. I can see why Foursquare tips suggested that we order it. Now, here's the best part. Spilt between four people- our individual checks were only $16 and change (with tax). We enjoyed wine, and walked away full. While it doesn't fall into my "Dining Deals" category of being under $10- this was certainly worth noting and could be a great option for diners looking to eat on the cheap. The dishes are all big enough to share, and it's always more fun that way anyway! I was happy to discover a new Indian place, and some friends to enjoy it with. "R" will tolerate it sometimes, but overall he isn't a fan. Looks like I found some new dining buddies when I'm in the mood for Indian! Yesterday, I cheated on my favorite diner. Gabe's Family Restaurant is our weekend haunt, and I loyally order the $2.99 egg special on every trip. But we pulled into the parking lot this Sunday, and there was not one spot available. Not one, what were we to do? We quickly scrolled through our options, and decided to head just a couple of miles away to Gus's Family Restaurant on State Road. It was our first time dining there, so here are a few initial thoughts. There is street parking after 9:30AM, and an ample parking lot across the street that is reserved just for Gus customers. It is seat-yourself, so we were able to select where we wanted to sit from the available options (I'm always a booth over a table kinda girl). I quickly noticed that there were several condiments on the table, including sweetener packets for my coffee (which I always have to ask for at Gabe's), maple syrup, and...sriracha! Major points with me. Of course, I ordered the same plate of breakfast basics that I would have gotten at Gabe's- two eggs (over-medium), bacon, homefries, and wheat toast. Add a cup of coffee. This plate of food was just $2.99 (Dining Deals Alert!). Now, at Gabe's the special does include one more egg. But who really needs three eggs with this? Gus's also included more homefries, an extra strip of bacon, and the wheat toast was way better. I think that I may have a new favorite diner. Congratulations to Renee from @BQRC23- you have won the one year's subscription to edible Cleveland giveaway! Please email me to claim your prize. The warmer weather is just around the corner, I can feel it. We were spoiled there for a bit, but the bitter cold of Cleveland crept back in. I'm ready for sandals and sundresses. "R" is ready for ice cream. He's a fanatic, even having ice cream twice in one day once. So, when Cincinnati's Graeter's Ice Cream asked me to do a product review in anticipation of its release to Giant Eagle stores in the Cleveland area- I knew that "R" would kill me if I didn't accept. When the package arrived last week, it was a good day in our household... They sent me Mint Chocolate Chip, Chocolate Chocolate Chip, Black Raspberry Chocolate Chip, and Vanilla Chocolate Chip- a nice variety of their famous chip ice creams. Here are our thoughts, and I had to include "R" because he is the real ice cream aficionado in our house. I'm more of a frozen yogurt/custard girl, shhhh. We can have a little Ohio pride, knowing that this ice cream has been family-owned and produced in Cincinnati since 1870. Five generations have kept it going, and they still use the same recipes and method. You can find their products in local Heinen's, but the big news is that they are hitting Giant Eagle stores as well! More ice cream for everyone. And this is "Oprah's Favorite Ice Cream", people. Just in time for the warmer months. Enjoy! While in New Orleans, one thing that I demanded that we do is take a walking historical culinary tour of the French Quarter. Known for its rich history and wonderful blend of food, I knew that we'd be in for a treat. They are approximately three hours long, and include a historical tour as you hop from one restaurant to the next. We started the tour at 2PM at the famous Hermes Bar at Antoine's Restaurant. Known for creating the first Oysters Rockefeller, the restaurant is still family-owned since 1840 and was just packed with history throughout its 14 dining rooms. We saw all kinds of memorabilia, and their block-long wine cellar made us drool. We sampled gumbo at this restaurant before moving on to stop number two: Leah's Pralines (pronounced "praw-leens") across the street. Too sweet for me, but everyone else seemed to really enjoy them. Then on to Arnaud's Remoulade for some shrimp remoulade with a great kick to the mustard-based sauce. This restaurant was just as unique as the others, and included artwork from the Spongebob Squarepants creator. Then we moved on to Desire Bistro & Oyster Bar for some turtle soup. This was our favorite dish of the tour, with lots of Creole heat and depth of flavor. We dined outside on their enclosed patio, and enjoyed a view of their hidden garden. You'll find hidden gems like this all over New Orleans- just peek down alleyways and you'll find these treasures. Then it was time to try New Orleans' famous sandwich- the Muffalino, and some gelato from La Davina. With thick bread, several Italian meats, and a house-made olive salad topping, the sandwich gave us a small taste of what all the fuss is about. We landed at Tujague's Restaurant (the second oldest restaurant in New Orleans) next for some beef brisket and a wonderful horseradish remoulade. This was a close second for favorite dish of the tour. By this point, it was about 5:00PM and we still had one more stop to go. Last stop: Creole Delicacies for a quick cooking demo and samples, and then shopping for sauces, spices, cookware, gifts, and more in their great shop. We picked up some popcorn rice, a crawfish boil seasoning packet, and a Christmas tree ornament to remind us of this fabulous trip. The great news is that you can order online, and they'll ship you all of the wonderful flavors of New Orleans! This tour was simply fabulous. Candy, our guide, was very knowledgeable, had a passion for good food, and a great sense of humor that kept us chuckling all day. We learned a lot about the French Quarter and the many influences in their culinary world- including French, Spanish, Italian, German, Creole, and Cajun. Such a melting pot of great history and flavors. It really reminded me of our own NEO Food Tours that started up last year. "R" and I attended the Shaker Square signature tour and had such a good time learning more about the neighborhood and sampling food from several of the restaurants on the Square. The tour in New Orleans was $45 a person, and for $75 in Cleveland you get a little more bang for your buck with portion sizes and cocktails are included at each stop. We actually preferred the Cleveland tour over our New Orleans one! The good news? NEO Food Tours is kicking off their signature tour series in June with a stop in Little Italy. I highly recommend checking out one of their tours, and enjoying some great food while you explore a neighborhood in your own city. Also, when you are traveling- check into whether or not the city offers some sort of walking culinary tour. It's such a fun way to explore a new city and sample the food that they are known for. Chef Zack Bruell's fifth restaurant, Cowell & Hubbard, opened in Downtown Cleveland recently on Euclid Avenue in the heart of Playhouse Square. This modern French bistro was a welcomed addition, and being a Bruell fan- I couldn't wait to check it out. Valet parking is available ($8), so parking was easy and I was quickly inside. The space is quite large, but is broken up into smaller areas using seating and decor. The bar is long and area open, so it's welcoming for anyone just popping in for a drink. The menu is daunting to say the least. With 21 appetizers and 11 salads, it's hard to even know where to begin. The good news? Most of it sounds amazing, and you leave wanting to come back and try more. I had asked around to see what people recommended, so narrowing my choices was a bit easier. I selected the Butternut Squash Ravioli with greens, jalapeno, and prosciutto ($9) from the Appetizers section. This dish is served with one large ravioli. The textures in this plate are just beautiful. My favorite component was the crispy prosciutto that added great bite to the dish. It isn't ideal for sharing, but I'd recommend this dish and I'd order it again. Only tiny criticism- it could have been served hotter, and I didn't taste any heat from the jalapenos. For my entree, I went with the Lamb Breast with yogurt, mint, preserved lemon zest, pine nuts, Moroccan spices and olives with cous cous ($19). For the price, the serving was large and I was able to take some home with me. The meat was tender and just fell apart at the touch. Overall, I did enjoy the dish and its combination of flavors- it was reminiscent of a beloved gyro. However, the lamb meat was a little fatty, and I had wished that there was more tang from the yogurt. The only thing that was not overly impressive with our experience was our server. She was a little "off" in both personality and attentiveness. A couple of other servers stepped in when they saw that we were waiting a long time to order, and when our dirty plates lingered a little too long. She also completely forgot a dessert that was ordered, but it eventually came out. So our meal ended up taking longer than anticipated, but we didn't really care since we were out for a fun girls' night of catching up and gossip. We had a great time, and even though L'Albatros will still remain #1 Bruell restaurant in my heart (mmm, cheese)...I will be back to Cowell & Hubbard. It just might have stolen the number two spot from Chinato. Thank you to all that entered the Market at the Foodbank ticket giveaway last week. I used random.org this morning to select a winner from the comments posted, and it selected Lucky #2- Tracy W. a.k.a. Ma. Congratulations! Tracy, you have until Thursday to email me to claim your prize, or then I will select another winner. Truly, I hope that you will all consider supporting this great event. You will more than get your money's worth in food, wine, and experience...and that $85 translates to 340 meals in a local hunger center. Visit www.cleveland.com/marketatfoodbank for more information. "We created edible Cleveland to bring attention to the people and stories that make up our local food community. edible Cleveland serves as resources for finding out what's in season, who’s producing it, and where you can find it. Every season the quarterly publication will introduce you to the people instrumental in making Cleveland’s food scene so vibrant. Every issue of edible Cleveland will express our core values: Beauty counts. We want to publish a magazine that’s worthy of the paper it’s printed on. Striking photography, the well-turned phrase, and a gorgeous layout combine to create an experience that feels remarkably indulgent. Browsing the pages of edible Cleveland will be an inspiration, and every issue will be an object of beauty. Be optimistic. edible Cleveland is a celebration. As such, we will strive to tell the stories that extend our sense of community, deepen our understanding of practices, satisfy our curiosities about food, and cultivate a vibrant food culture. Local matters. Although edible Cleveland is a member of a thriving national movement, the focus of our work is local, and it will stay that way. We will work with local writers and artists to capture the people, places and food that make up our region’s particular culinary culture. Be of value. edible Cleveland will be a resource for everyone interested in our food culture and will strive to bridge the gap between those who love food and their food sources. Although it is called edible Cleveland, we include Lake, Geauga, Portage, Summit, Medina, and Lorain counties, since they all contribute, with the communities of Cuyahoga County, to our regional food culture. And we’re a member of Edible Communities, a James Beard Award-winning publishing and information services company that creates editorially rich, community-based, local foods publications in more than 50 distinct culinary regions throughout the United States and Canada. Founded in 2002, Edible Communities the world’s largest publisher of information about local foods with a combined print run of more than five million issues per year and an annual readership of more than fifteen million." 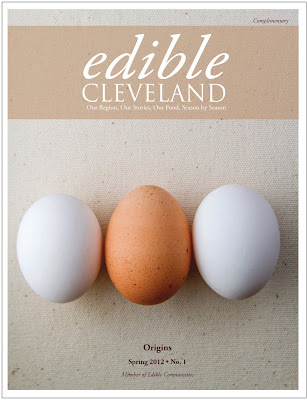 Personally, I'm thrilled that edible Cleveland is now available and can't wait to get my hands on the first issue. Want to win a year's subscription? Tell me below what your favorite food magazine is, and why. We love Cuisine at Home for recipes- it never fails. Leave a comment to be entered, and gain a second entry by tweeting "I want to win an @edibleCleveland subscription from @BiteBuff here http://tinyurl.com/73kup5x ." Make sure that you leave another comment to let me know that you tweeted. I will select a winner using random.org on Friday, April 13th. Good luck! Disclosure: I was provided with a year's subscription for myself and one to give away on the blog in exchange for this post. The opinions stated are 100% my own. Thank you to edible Cleveland for this opportunity. One of the best food events in Cleveland is coming up on Sunday, April 22nd- Market at the Foodbank (formally Market Under Glass). This year, the 17th annual event, moves from the Galleria to the Cleveland Foodbank's 100,000 square foot community food distribution center. The event benefits the Foodbank's annual Harvest for Hunger spring campaign, and brings together over 1,000 people to enjoy a night of food and drink from more than 50 of Cleveland's best restaurants, caterers, and beverage purveyors. The night also includes an auction, chance raffle, entertainment, local celebrity servers, and more. General admission tickets are $85 each, or $100 at the door. A VIP ticket option is available for $150, which includes an exclusive private reception and early entrance. Or, you can win two general admission tickets here! The Foodbank has generously provided me with two tickets to give away to one lucky reader. Just leave a comment below telling me which restaurant you look forward to trying from the list of fantastic restaurants participating in this event. You have until Monday, April 9th to enter, and I will use random.org to select a winner. You can receive a second entry by tweeting: "I want to win #MarketatFoodbank tickets from @BiteBuff at http://tinyurl.com/6vbd3se ." Make sure that you leave a separate comment for each entry. There will be something savory for everyone, and lots of sweets and adult beverages to accompany it all. Tempted yet? This event is one not to miss, and all proceeds benefit one of the best organizations that our city has. For every dollar donated to Harvest for Hunger, the Cleveland Foodbank can provide enough food for four meals in a local hunger center. This year's Harvest for Hunger goal is to raise enough food and funds to provide 16 million meals to our local hunger centers. 16 million- wow, and you can help! Enter to win my giveaway, or head straight over to www.cleveland.com/marketatfoodbank to purchase tickets. Disclosure: I was provided with two general admission tickets to give away to one reader, and two for myself and a guest to attend the event in exchange for this post. Also, I am a former employee of the Cleveland Foodbank, and used to plan Market Under Glass for them. My opinions are 100% my own. Last night we dined at Brandt Evan's Pura Vida in downtown for the first time, and overall we had a poor experience. I know that it has become a popular lunch spot for people that work in the area. Has anyone else had positive or negative experiences with dinner service? I was a little surprised. First off, it was dead for a Saturday night. We easily got a 7:00PM reservation just the day before, and at no point was the dining room full. When we left around 9:00, it was mostly empty. I saw some comments on Foursquare that the service was lacking, and that certainly was what happened with our table of six as well. Our server was absent most of the evening, with a significant wait to place our order and long lags between ordering and receiving food and drinks. We even watched "R's" beer sit at the bar for over 10 minutes before she brought it to the table. Keep in mind that they weren't slammed, and appeared to be adequately staffed. When she was around, she was pretty short with us but no notable attitude. The meal didn't start off well with us discovering that some of the glassware on our table had visible lip marks on them. Gross. But, on to the food. I ordered a cup of the Shrimp and Corn Chowder ($5) with oyster crackers and old bay seasoning. It was served lukewarm, and needed a lot more seasoning. It was pretty bland, but had potential. "R" and I shared the Duck Confit jar with balsamic onions, goat cheese, and thyme served with grilled bread and shaved local radish ($12). This was the only dish that we enjoyed. The concept is that the contents of the different jars can be used as a spread or dip. For the main course, I ordered the Scallop special that came with four scallops and a mushroom spaetzel. As soon as it hit the table, I could see that the scallops were overcooked. Yup, totally dried out and they had taken on a gummy texture. The spaetzel was nothing special, and lacking any real flavor. The scallops were piping hot (first thing of the night), but the spaetzel was barely warm. "R" ordered the BBQ Duck Confit with jalapeno scallion mac and cheese with a Kentucky bourbon BBQ sauce ($24). The duck was tender and had a nice crispy skin, but the one thigh was a very small portion for the price. Also, the mac and cheese side reminded me of a certain boxed brand with bread crumbs tossed on top. Am I totally off-base here? Anyone else have a similar experience? I usually believe in second chances, but this experience really left me not wanting to go back. Nothing was so terrible that it was worth tracking management down, but just overall it was a let down. It was pricey for what we received in portion size and quality, and I kind of don't care to try it again. What do you think?